These departments/units work in a holistic manner to provide a coherent, balanced service to the DUT Community and all external stakeholders. 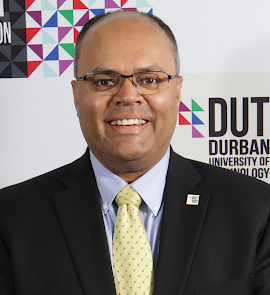 Bio: Alan Khan is the Senior Director of Corporate Affairs at the Durban University of Technology. He works with the Communications, Design Studio, Student Recruitment and Marketing, Public Relations and Events departments at the University. Alan is an Alumnus of DUT and he has served as the inaugural President of DUT’s Convocation. He is also a former Council member of the University. Before joining DUT in July 2011, Alan was CEO of Jacaranda FM and prior to that, he was the Deputy Managing Director of East Coast Radio. Alan was inducted into the South African Radio Hall of Fame in 2015 and in 2017, his talk show on Lotus FM at the SABC won “Best News & Actuality Talk Show” at the South African Radio Awards. He also serves as a Trustee of the Engineering Educational Trust.